Congratulations to our Adult College Students of the Semester, Claude Laviscount and Ardita Lufaj! Management accountants are vital to the financial health of organizations. They make critical decisions, safeguard a company’s integrity, and plan for business sustainability. They might be CFOs and controllers, budget analysts and treasurers, or one of many other game changers on internal teams. However, every job opportunity in this field is highly competitive and every college student willing to succeed in the industry must learn the importance of differentiation early in their careers. Congratulations to our Fall 2018 Students of the Semester, Angie Jaramillo and Trayvon Campbell! 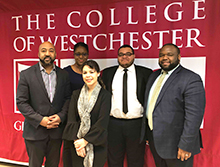 The College of Westchester is will be offering courses on Saturdays for the Spring II Term. The Saturday Spring II session starts May 4th and ends June 22nd. Class meeting time is from 8:30am – 12:15pm and will be open to Day and Adult College students. Learning, networking, and meeting new people are pivotal components for a successful business. Recently CW’s Enactus Club hosted an entrepreneur’s expo to inspire our entrepreneur students to showcase their products and services to the CW community.